3Gstore.com Blog: Cellphone-Mate 3G/4G Fusion 5 Amplifier On Sale for $999 - LIMITED TIME ONLY! Cellphone-Mate 3G/4G Fusion 5 Amplifier On Sale for $999 - LIMITED TIME ONLY! If you've been kicking around the idea of installing a cellular repeater in your home or office, don't delay! 3Gstore is offering a $500 discount on one of the most versatile wireless repeaters to date. Of course, we're referring to one of our 5 band amplifiers, the CellPhone-Mate Surecall Fusion-5 70db wireless repeater. This amplifier, which supports BOTH Verizon and AT&T LTE networks simultaneously, is regularly $1499. However, you can purchase it at a discounted rate of $999 through 11/19/13! 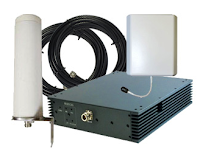 We also sell this amplifier as a pre-bundled repeater kit (one with an Omni antenna & one with a Directional Yagi), which will include everything you need to get started. So, don't hesitate, contact 3Gstore to place your order today!